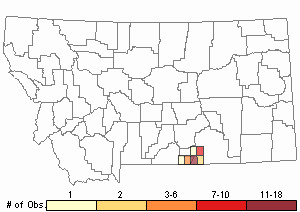 Wyoming Sullivantia is regional endemic known in Montana only from a few, clustered locations. It grows in small, fragile aquatic habitats that may be vulnerable to hydrologic changes from water development or diversion, or trampling. CommentAvailable data suggests population is over 100,000 plants, though there is some uncertainty. Score 7 to 9 total points scored out of a possible 16 (Rarity factors and threats only). Sullivantia hapemanii is a perennial herb with erect, glandular to hairy stems which stand 5-60 cm high. The basal leaves have petioles (stalks) which are usually much longer than the blades; the blades are 1-11 cm wide and kidney to circular shaped with 5-13 palmate lobes and sharply toothed margins. The few stem leaves are alternate, smaller than the basal leaves, and have short petioles. The flowers are borne in a glandular inflorescence with long spreading branches. The calyx is green, 1.5-3 mm long, and is bell-shaped with 5 triangular lobes. There are 5 separate white petals which are 1.2-5 mm long and are broad spatula-shaped and narrowed at the base. There are 5 short stamens and a single pistil which is about 1/2 buried in the hypanthium. The fruit is a dry, 2-celled, multi-seeded capsule, with axil placentation. The two varieties can be distinguished by measurable differences in the appearance of the ovary at anthesis and mature fruiting capsules. In variety hapemanii the ovary is about as long as it is wide; while in variety purpusii the ovary is usually about twice as long as it is wide. The fruit of variety hapemanii is an ovate cylindrical capsule less than 2.5 times (usually ca 2 times) longer than broad at maturity; in contrast the fruit of variety purpusii is long and cylindrical, and is very narrow in relation to its width, at least 2.5 times longer than broad at maturity (Soltis 1991). Flowering occurs in late June and July. Sullivantia hapemanii is one of the few members of the Saxifragaceae in south-central Montana with a widely branched inflorescence and lobed leaves. The leaves of Saxifraga odontoloma (=arguta) are toothed on the margins but not deeply lobed. Telesonix jamesii has purple flowers and occurs in dry rock crevices. Montana plants are var. hapemanii. Globally this species is restricted to a few areas in the mountains of Wyoming, Montana, Idaho and Colorado; within this area the two varieties have distinctly different ranges. Sullivantia hapemanii var. hapemanii occurs in the Bighorn Mountains, and Bighorn Canyon area of North-Central Wyoming and South-Central Montana; and disjunct sites in Wind River Canyon and on Casper Mountain in Wyoming. Additionally, a disjunct population of var. hapemanii occurs in the Middle Fork Salmon River drainage, in Central Idaho. Sullivantia hapemanii var. purpusii occurs in Western Colorado in Garfield, Rio Blanco, Gunnison, Pitkin and Montrose counties. Most of the occurrences in Gunnison and Montrose counties are in the Black Canyon of the Gunnison. Wyoming sullivantia grows on calcareous rock walls and boulders at springs, waterfalls and streambanks, or where there is seepage from limestone or dolomite (Heidel and Fertig 2000). Some of the most dramatic settings are natural amphitheaters, where the species covers cavernous interior walls. These sites are often north-facing, in the shade of rock overhangs, or under tree and shrub canopy; a few receive partial or full sun (Heidel and Fertig 2000). It occurs across a wide range of elevations, from the foothills to montane zones. In optimal seepage habitat -- large, stable coldwater seeps -- Wyoming sullivantia is the most abundant vascular plant and can form 100% cover (Heidel and Fertig 2000). These rare communities were called sullivantia seeps by Lichvar et al. (1985). Commonly associated vascular plants include Carex aurea, Aster foliaceus, Catabrosa aquatica,and Glyceria striata. Mosses are abundant in most of these habitats. In the best developed riparian habitat, Wyoming sullivantia grows at the edge of streams in wooded, shrub-lined riparian corridors with Betula occidentalis, Acer negundo, Acer glabrum, Populus angustifolium, and Physocarpus monogynous. Wyoming sullivantia often occurs in deep shade of trees or rock overhangs. It appears to be very competitive in shaded settings, often forming nearly solid monocultures. However, population densities vary greatly between occurrences, and some of the "larger" populations are restricted to one or few small areas that are less than 10 meters square. This species has narrow ecological amplitude and occupies a fragile habitat that is directly affected by any changes in groundwater discharge and streamflow conditions. Seeps that dry out at the surface during the growing season do not support this species. It also does not occur at developed and impounded springs in the area, and may have been extirpated at some of these sites. Wyoming sullivantia is characterized as a wetland obligate (USDI Fish and Wildlife Service 1993), variously growing as an emergent with the base of its stem submerged, on sheer wet slopes, or in mats of aquatic mosses that wick the moisture. The rooting materials include calcium carbonate-rich precipitate, and loose gravel. In any case, the substrate is unconsolidated and is held together at least in part by the plants' intertwined roots and sometimes by mosses. 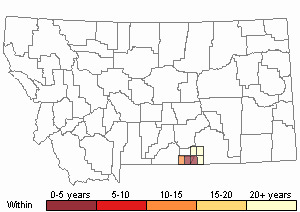 The primary factor affecting the long-term persistence of Wyoming sullivantia is maintaining stable groundwater and surface water flow and quality (Heidel and Fertig 2000). While many of its occurrences in Wyoming are often located in remote settings where there are few direct impacts, populations at the north end of Bighorn Canyon NRA may be more vulnerable to reservoir and stream/groundwater management decisions. Wyoming sullivantia grows on unconsolidated substrate that can be highly sensitive to trampling. Its habitat is not currently used by stock (Heidel and Fertig 2000). Heidel, B.L. and W. Fertig. 2000. Rare plants of Bighorn Canyon National Recreation Area. Report to the National Fish and Wildlife Foundation and Bighorn Canyon National Recreation Area, National Park Service. Montana Natural Heritage Program and Wyoming Natural Diversity Database. Helena and Laramie. 63 pp. plus appendices. Lichvar, R. W. E. I. Collins, and D. H. Knight. 1985. Checklist of vascular plants for the Bighorn Canyon National Recreation Area, Wyoming and Montana. Great Basin Naturalist 45:734-746. Soltis, D. E. 1991. A revision of Sullivantia (Saxifragaceae). Brittonia 43(1): 27-53. Soltis, D.E. 1980. Flavonoids of Sullivantia: Taxonomic implications at the generic level with the Saxifraginae. Biochemical Systematics and Ecology 8:149-151. Soltis, D.E. 1981. Variation in hybrid fertility among the disjunct populations and species of Sullivantia (Saxifragaceae). Canadian Journal of Botany 59:1174-1180. Soltis, D.E. 1982. Heterochromatin banding in Boykinia, Heuchera, Mitella, Sullivantia, Tiarella, and Tolmiea (Saxifragaceae). American Journal of Botany 69(1):108-115. Web Search Engines for Articles on "Wyoming Sullivantia"